Bengaluru/New Delhi: It is a truth universally acknowledged that most people with mobile phones must be unhappy with their telco (never mind which one it is). Those with Airtel connections hate Airtel. Those with Vodafone connections hate Vodafone. Service quality has dipped in recent years—partly because of spectrum shortage; partly because most telcos are loaded with debt arising from 3G (high-speed third-generation services) and 4G auctions; and partly because of a court ruling that has resulted in many cell towers in residential areas being taken down. Last month, communications minister Ravi Shankar Prasad said the government was looking at penalizing telcos for poor service. In a bid to address the issue of the lack of space for towers, the minister said he had asked state governments to permit the use of government buildings for towers and had also asked chief ministers to look at making it mandatory for buildings to have broadband ducts as part of the building code. On Tuesday, Prasad reaffirmed the government’s resolve to clamp down on poor-quality services and said the department of telecommunications (DoT) would audit telecom networks with the objective of reducing call drops. But all telcos can’t be uniformly bad. To find out India’s best and worst telcos, Mint, in association with InstaVaani, a polling agency, called over 4,000 customers across seven cities (wherever Mint is published from, New Delhi, Mumbai, Bengaluru, Chennai, Hyderabad, Ahmedabad and Kolkata) and asked them how happy they were with their telco. 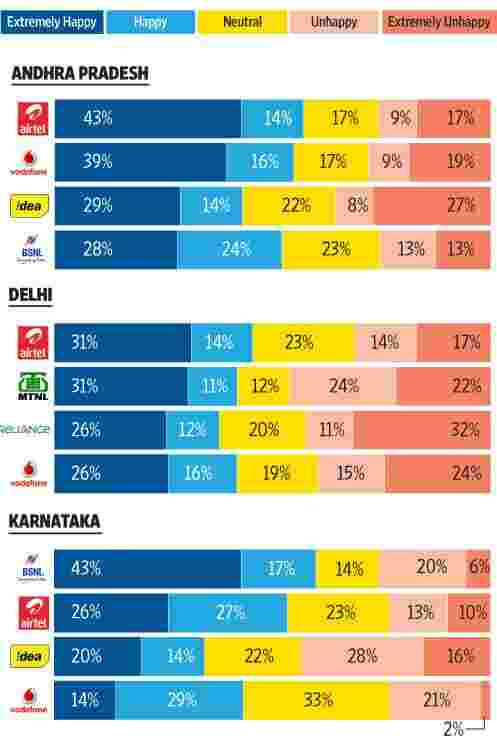 The results: India’s best telcos are Aircel Ltd (which has a limited presence) and Bharti Airtel Ltd (followed by Vodafone India Ltd and BSNL, although there is a big gap between Aircel and Airtel, and very little to choose between the other three statistically). The worst ones are Reliance Communications Ltd, state-run Mahanagar Telephone Nigam Ltd (MTNL) and Idea Cellular Ltd. The one thing that is clear is that there is a huge gap between Aircel and the rest. Indeed, there is almost no difference between Airtel, Vodafone and BSNL, which are grouped together below Aircel, in that order mathematically. The gap between these three and Aircel, and the dominant market share of this grouping, clearly suggests that telecom services in India are uniformly sub-optimal across telcos. “At Airtel, customers are at the heart of everything we do and we constantly look for ways to enrich their life—be it with seamless service delivery, robust network, innovative products & services which together enhances their experience," an Airtel spokesperson said in an emailed comment. Reliance Communications, Vodafone India Ltd, Idea, MTNL and Bharat Sanchar Nigam Ltd did not respond to requests for comment. “We are delighted to be ranked the highest on the survey and these results are a testimony to Aircel’s commitment towards its valued customers. As a customer-centric organization, we follow a ‘customer first’ strategy where ‘customer listening’ is key and we are constantly driven by customer insights and feedback," an Aircel spokesperson said. Analysts attribute the fact that Aircel has come out on top to its lower customer base. “If you have a relatively smaller customer base, then you have fewer customers to handle. In India, we have the least amount of spectrum per million customers compared with anywhere in the world. Everybody is trying to grapple with that," said Hemant Joshi, a partner at Deloitte in India. Aircel’s performance also needs to be seen in the context of its presence—it is present in any significant way in only one of the seven cities surveyed. “I don’t expect that its coverage is any better than any of the other telcos but fewer users means lesser congestion in the networks," Rajan Mathews, director general of the Cellular Operators Association of India, the key lobby group for India’s GSM technology-based telcos, said. “You also have to remember, the farther away from the congested metros you go, the lesser the call-drop problem is." But Mathews is willing to be generous. “It cannot be just that. They must be doing something right," he added. 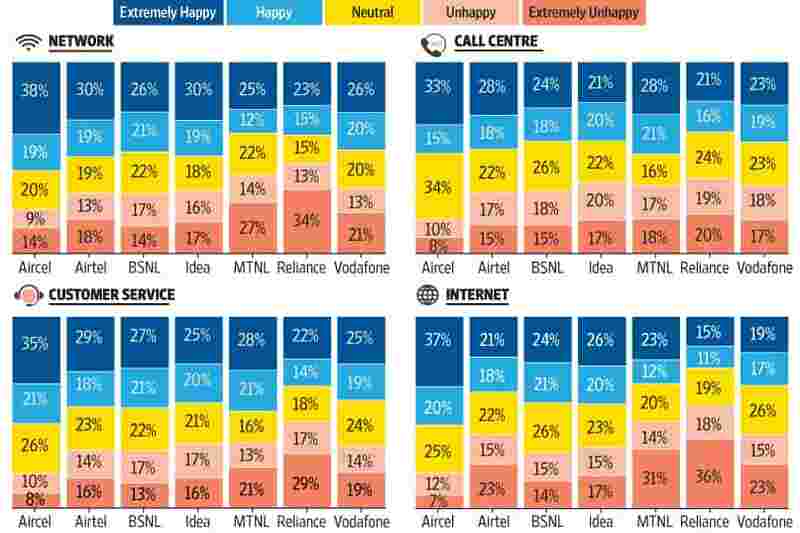 The survey highlights issues Indian telcos have been grappling with for over a decade. Top of the list is the shortage of spectrum or radio waves. “We have the lowest spectrum per million mobile users in the world," Joshi said. “Most of the spectrum that has been acquired in the recent auction was to keep existing operations going." India has the most stringent radiation norms in the world, with “EMF (electromagnetic frequency) emission standards that are a tenth of global standards" according to Joshi. That means cell towers can carry only limited equipment and, therefore, have limited range. “But you cannot create towers everywhere," Joshi added. He expects the problem to get worse. Then there is growth, especially in data, which pays the telcos more. “On the same highway where you have voice, you are selling data aggressively. Then definitely there will be a choke point and therefore you have call drops," Joshi explained. High-speed third-generation networks such as 3G could have been the solution, especially because 3G spectrum can handle more traffic than 2G spectrum, only most telcos do not have national 3G footprints. And “most telcos are slowing 3G roll-outs for now", Joshi said. If the problem of calls dropping seems to have become more severe in recent months it is because it has. At the beginning of the year, many telcos started shifting their operations to new spectrum acquired in the February 2014 auction. This shifting caused a large number of call drops. The poor quality of service also relates to the fact that India has some of the lowest call tariffs in the world and a large number of telcos. The cost of buying spectrum and setting up networks is one of the highest, leading to half of the country’s telcos making losses every year. All telcos have heavily leveraged balance sheets; in some cases debt is almost five times the earnings before interest, tax, depreciation and amortization (or operating profit) of the company. “It is a challenge for telcos to service debt and cash flows in an environment where they are heavily leveraged and the Arpus (average revenues per user) are some of the lowest in the world. You have to keep the business going. So what they do is defer the capex expenditure on things like 3G rollout and such. If they did not have to pay so much for the spectrum, there may have been more money to roll out 3G and better technologies," Joshi said. Mint’s survey on telecom operators was conducted across seven circles, chosen based on the seven biggest publication centres of the newspaper. In each of these seven circles, we chose the three largest private sector telecom operators (by market share) and the government operator (markets in which Bharat Sanchar Nigam Ltd, or BSNL, and Mahanagar Telephone Nigam Ltd, or MTNL, operations are mutually exclusive), and surveyed at least 500 customers per circle. It is tempting to aggregate customer responses and get consolidated scores by operator and circle, but we didn’t do that because there is no objective method to translate customer responses into numerical scores. Apart from questions on overall happiness with their telecom vendor, customers were also asked to rate their vendors on four specific areas: quality of network coverage, quality of Internet (data speeds), quality of overall customer service, and quality of the provider’s call centre. National figures are prone to aggregating, and consequently hiding, information—for example, we see that Reliance Communications Ltd has poor ratings overall, but how does it perform in the different circles in which it operates? Aircel Ltd, the best telecom provider as established by our survey, has a significant market share in only one of the seven circles surveyed, viz. Chennai, and we see that it has pretty good ratings there. The next best operator in Chennai is Vodafone. Airtel Ltd brings up the rear, worse than even the public sector operator BSNL. Reliance Communications holds its own in Mumbai, where there is nothing to differentiate among different operators, but does significantly worse than its competitors in Kolkata and Delhi. The best network in Kolkata, according to our survey, is Vodafone India Ltd, but it comes a poor second to Airtel in Delhi. The performance of the two state-owned networks, which once had a monopoly on fixed-line telephones, is very interesting. MTNL, which operates in Mumbai and Delhi, does badly in both places. While there is little to choose between operators in Mumbai, a little more careful observation shows that MTNL is marginally worse off than the others there. In Delhi, however, MTNL competes to be the worst network along with Reliance Communications. 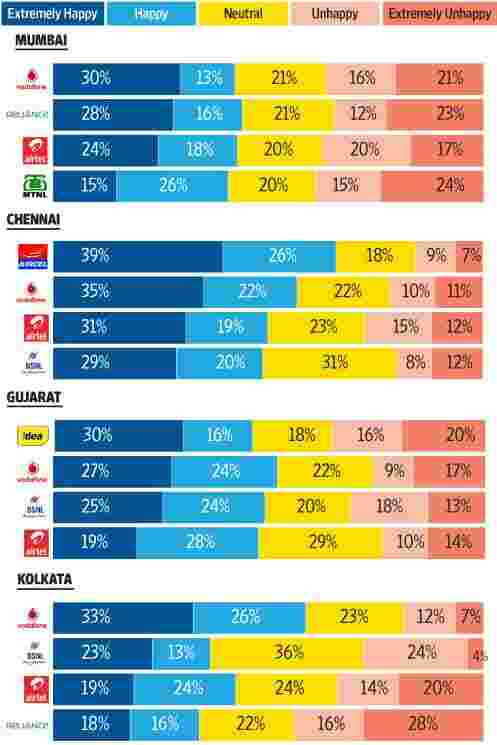 In contrast, the other state-owned telco, BSNL, has received pretty good ratings in most circles where it is present. While it is the best operator by a long way in Karnataka, it more than holds its own in other circles where it has a significant market share. 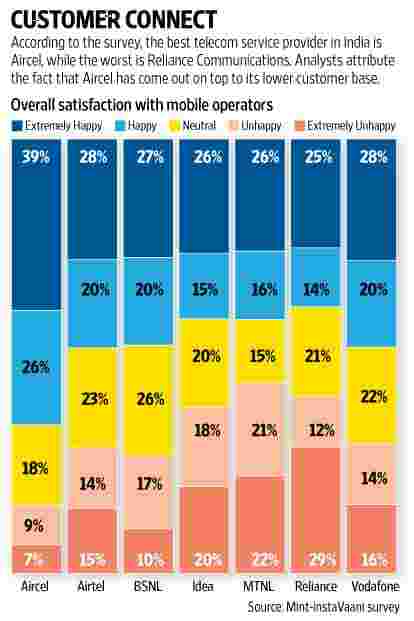 Finally, based on the survey, can we try and understand factors behind customers’ satisfaction with networks? What is it about Reliance or Idea Cellular Ltd that makes them laggards? To analyse this, we segmented people based on their response to the question on their overall satisfaction with their telecom operator and looked at how they rated their operators on different dimensions. From this analysis, it is not very clear what factors are most important, but relatively speaking, the quality of network coverage seems more important than other factors. This might also explain why BSNL has a significantly better rating than MTNL—the former has a general reputation (not based on this survey) of offering superior network coverage than all other operators, especially in remote areas. The story has been modified from its original version.